I'm going to let you in on a little secret. I hate winter. I know, totally novel concept, right? But really, let me tell you why -- and it's not just because it's freezing and walking through the slushy, snowy streets of New York is at times completely impossible. No, it's because with the onset of freezing temperatures comes the fact that my skin cracks, peels, chaps and otherwise looks pretty unbelievably horrible. That is, until I introduced L'Occitane Pure Shea Butter Vineyard Rose into the mix. I've long been a fan of the nourishing properties of shea butter, and with good reason -- it's the only thing that keeps my skin from looking and feeling terrible when it's 6 degrees outside! But this pretty little tin from L'Occitane really takes shea butter to the next level. It's formulated with over 95 percent certified organic shea butter from fair trade women's cooperatives in Burkina Faso, West Africa, which I just think is pretty darn cool. A dime-sized amount is all that's needed to bring moisture, hydration and nourishment back to even the driest skin almost immediately. I've been slathering it on my hands and elbows before bed, and let me tell you -- my skin has never been softer! This is thanks not only to the shea butter but the Vitamin E found within the formula. And the fact that it's enriched with organic rosehip oil, meaning it smells amazing? Just an added perk. 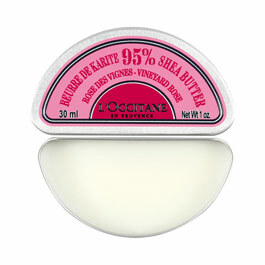 L'Occitane Pure Shea Butter Vineyard Rose retails for $15 at loccitane.com.